Olympic National Park’s Sol Duc hike will take you to an area of the park with the largest concentration of glacial lakes. 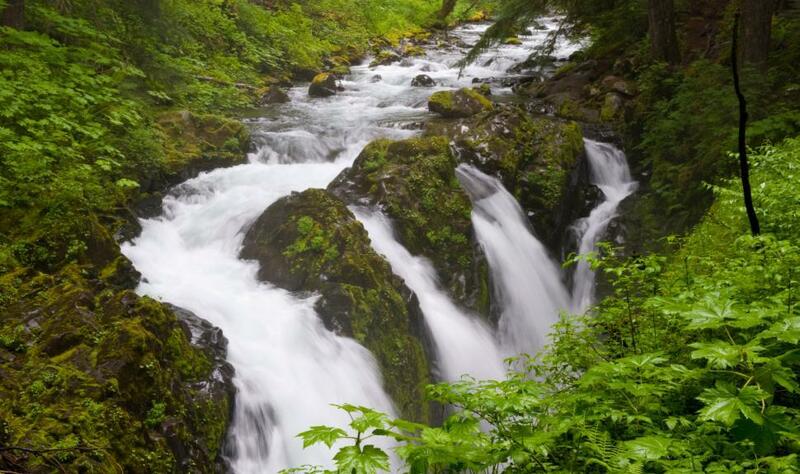 High mountain peaks and sub-alpine meadows surround the Sol Duc region. Campsites along this route can be scenic destinations in and of themselves because of the outstanding mountain views from these sites. Marmots and mountain goats can be spotted in this area as well as the occasional Roosevelt Elk. This guided tour can be offered in either a 3 day or 4 day version, both of which follow the same loop through Olympic National Park. On the 4 day Sol Duc tour the group breaks takes 2 days to hike from Lunch Lake to Appleton Pass, camping the night at the scenic Heart Lake which is at 4,744 feet above sea level. The hike to Heart Lake is only 3.5 miles, leaving time for the group to take to day hike along the High Divide that afternoon. *Route Variation – Our specific hiking route and campsites on each departure are dependent upon permit availability. Upon meeting at the trailhead parking lot, the group will pack up and start hiking to the Seven Lakes Basin. Waterfalls and amazing views of the Olympic Range is just some of the awesomeness you will get from today. After 6.7 miles (10.8km) and a 3,000ft (914.1m) increase in elevation, the group will reach camp at Lunch Lake for the evening and take the rest of the afternoon exploring the other lakes in the basin. The total hiking distance is 7.8 miles (12.8km). After breakfast, the group packs up camp and heads back to the High Divide Trail and the summit of Bogachiel Peak. At this point Mt Olympus is in clear view to the south. We will ascend over 2,000 ft over 2.5 miles to camp at Appleton Pass, 5,000ft (1,524m) in elevation. Total hiking mileage is 9.9 miles (15.9km). From Appleton Pass, we return to Sol Duc River and follow the trail along the river, hiking downhill towards the familiar Sol Duc Falls to complete the loop. Along the way, the trail will pass through several stands of organic first-growth forests that are typically the larger trees to grow in the Olympic Rainforest.